All this Twin Flame Talk?? 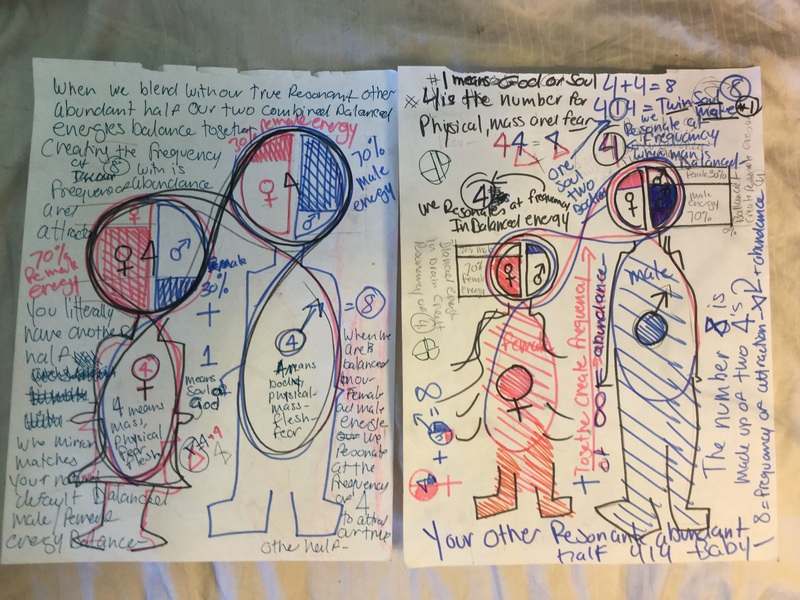 A diagram to show my own female/male energy balance ratio mirror balance with my twin. Apparently we really do have another half of our soul. I channeled this information without knowing much about it even though there seems to be a lot written about it already. I am behind on a lot of already known information. 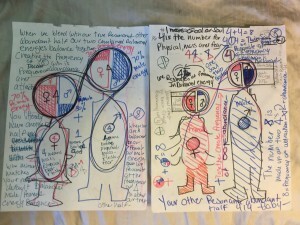 However, I did channel that there is a mate on this planet for me that mirror matches my female/male default balanced energies and that together, when we are in our positive balanced energies we effortlessly resonate at the frequency of eight. Eight is the frequency of abundance and attraction. It was designed that I should manifest an abundant life by balancing female and male energies within my own brain, within my relationships and within my work or world. When we are with our true resonating mirror matching mate we effortlessly or unintentionally blend our two opposite energies harmoniously creating a whole unit of abundant manifesting energy. Although this may seem like a spiritual concept it is apparently science. Or we could say it is the natural way we are supposed to strongly and deeply bond with our mate. A union that is so deeply bonded on a soul level creates a bond that is strong enough to be a foundation from which a third expansive creation can be sprung. It is from the power created from such a deeply bonded relationship that significant global improvements can be made. The constant synchronicity I experienced around the numbers 414 recently finally revealed their true meanings to me clarifying that I have indeed a twin flame. I kept asking my spirit guides over and over for the reasons I kept seeing those numbers. They seemed not to respond for a few years. At times I’d yell it it out loud in frustrations after I’d pick my phone up at exactly 414 day after day… Sadly no answers seem to come. This sent me on a mission to better understand number meanings and I have since researched number meanings in the bible and in other philosophies. The best I could conclude at the time was that the number one represents God, Source or our soul, (the God within) and the number four represents the physical or mass, mass has four elements. However, this information still did not clarify for me why I was being shown those numbers so often. Finally one afternoon, while running, I stopped at a red light and not surprising to me, the car in front of me had the license plate 414. It idled in my face for a good long time while I waited to cross the street. As I waited I asked again, “I know, I know you are trying to tell me somthing, what are you trying to tell me?” That car passed and right away another car rolled up with the license plate 818 in the same place. I got it! It told me that 4 and 4 make 8 and I knew that eight is the number of abundance. It clarified that 414 means two bodies one soul in balanced 4 frequency creating the abundant resonating frequency of 8. The soul you share with your twin is not divisible. When you are separated from your twin your shared soul acts like a stretched out rubber band waiting for both of you to let go so that you can be pulled back together again. Also, when we are balanced in our female/male energies we resonate at the exact same frequency as our mate attracting them like a magnet. It is usually for the benefit of the greater whole that twins unite, however sometimes twin flame unions are brief and simply used for intense spiritual growth. The destiny of your twin flame relationship has already been planned by you and your twin flame before you were both born and you both intuitively know exactly what that plan is. Good luck all you twins out there may you attract each other in divinely planed ways and time. 2 Responses to "All this Twin Flame Talk??"